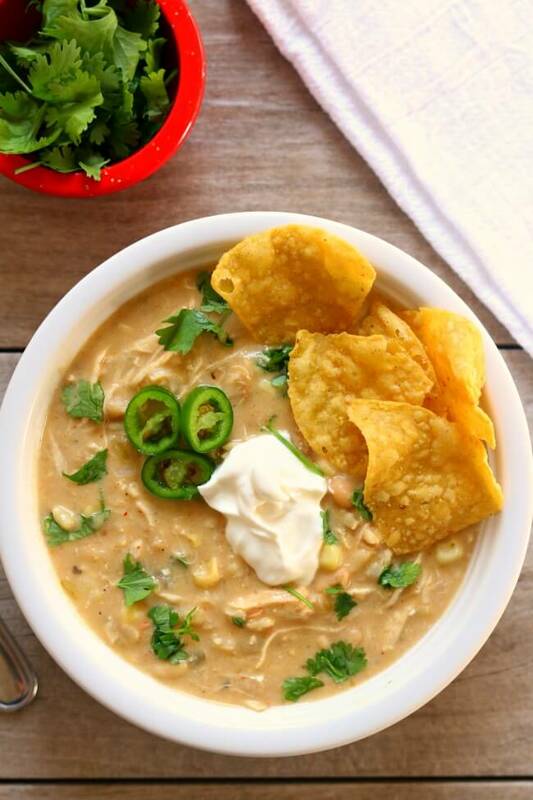 Instant Pot Green Chile Chicken Enchilada Soup–thick and creamy soup with all the flavors from salsa verde chicken enchiladas. Chicken and rice cook quickly in your pressure cooker along with enchilada sauce, green chilies, white beans and flavorful spices. Cream cheese and sweet corn are stirred in at the end along with fresh lime juice for a splash of flavor. 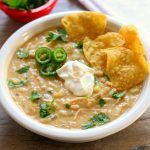 I think you’re really going to like this thick and creamy Instant Pot Green Chile Chicken Enchilada Soup! It’s got a great texture and the flavor is amazing. 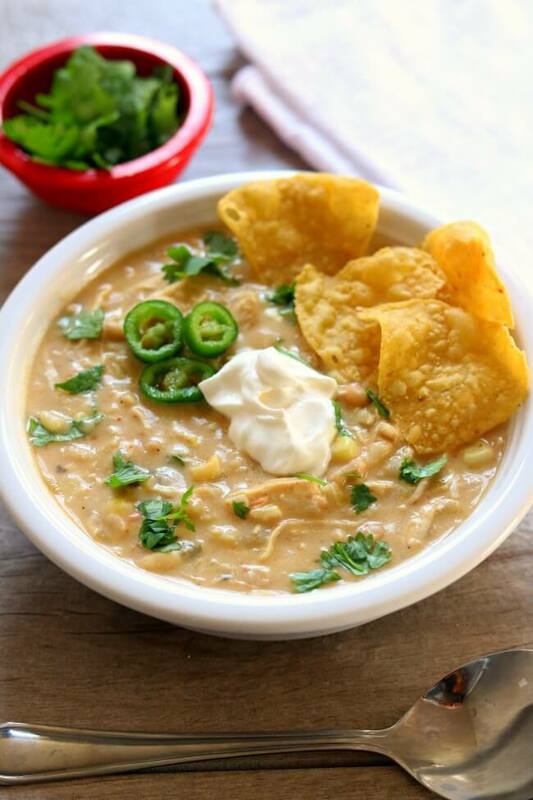 It’s perfect for a chilly night and is similar to white chicken chili, which is one of my absolute favorites. I started with chicken breasts that were frozen. If you are using fresh chicken, great! No changes to the cooking time are necessary. Your Instant Pot will just come to pressure quicker. I used 2 chicken breast halves which was plenty of chicken. This soup is heavy on the chicken. So if you want less meat you could definitely use 1 1/2 chicken breast halves instead. For loads of flavor, I added in my favorite broth base, Better Than Bouillon, along with green chile enchilada sauce and green chiles. I used cumin and chili powder to give it some mexican flare. Finally I added in uncooked brown rice and some canned white beans. Now I’m sure some of you will be asking can I use white rice? And the answer is yes. You’ll just cook it for less time. I cooked mine for 22 minutes on high pressure. If you want to use white rice I would only cook for 10 minutes on high pressure. I haven’t made it myself with white rice but if I were to guess this is what I would do. Maybe some of you are asking if you could use dried white beans instead of canned. I am thinking that you could. But you’d definitely want to use soaked beans and you’d have to add in extra broth or water. One thing with dried beans is that they do not get soft if they are cooked with anything acidic, like tomatoes. So I’m thinking you’d have to leave out the enchilada sauce and the green chiles until the beans were soft and then stir it in. Let me know if you try it and how it turns out! If you have trouble with dairy you can definitely leave out the cream cheese. It will just be more brothy and less creamy but it will still taste great. All in all, this is a really adaptable and forgivable recipe! For Instant Pot Green Chile Chicken Enchilada Soup I used my 6 quart Instant Pot Duo 60 7 in 1. I also own the 6 quart Instant Pot IP-LUX60 V3 Programmable Electric Pressure Cooker. They are both great pressure cookers! The first one I mentioned has a yogurt making function but other than that they are fairly similar. The price difference between the two is about $20. 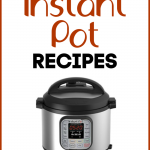 I’m considering getting an 8 quart Instant Pot…maybe I have an addiction??? Thick and creamy soup with all the flavors from salsa verde chicken enchiladas. Chicken and rice cook quickly in your pressure cooker along with enchilada sauce, green chilies, white beans and flavorful spices. Cream cheese and sweet corn are stirred in at the end along with fresh lime juice for a splash of flavor. Add chicken, water, bouillon, enchilada sauce, green chiles, salsa, cumin, chili powder, onion powder, garlic powder, rice and beans to the Instant Pot. Give a little stir. Cover the pot and secure the lid. Make sure valve is set to “sealing.” Set the manual timer to 22 minutes on high pressure. When the timer beeps let the pressure release naturally for at least 10 minutes (if you have the time a full natural pressure release is best). Remove the lid. Place the chicken on a cutting board and shred. Add it back into the pot. Stir in the corn and cream cheese, until the cream cheese is melted. Stir in the lime juice. Salt and pepper to taste. Ladle into bowls and serve with desired toppings. I started with chicken breasts that were frozen. If you are using fresh chicken, great! No changes to the cooking time are necessary. It will just come to pressure quicker. I used 2 chicken breast halves which was plenty of chicken. This soup is heavy on the chicken. So if you want less meat you could definitely use 1 1/2 chicken breast halves instead. I added in uncooked long grain brown rice. Some of you will be asking can I use white rice? And the answer is yes. You’ll just cook it for less time. I cooked mine for 22 minutes on high pressure. If you want to use white rice I would only cook for 10 minutes on high pressure. I haven’t made it myself with white rice but if I were to guess this is what I would do. Maybe some of you are asking if you could use dried white beans instead of canned. I am thinking that you could. But you’d definitely want to use soaked beans and you’d have to add in extra broth or water. One thing with dried beans is that they do not get soft if they are cooked with anything acidic, like tomatoes. So I’m thinking you’d have to leave out the enchilada sauce and the green chiles until the beans were soft and then stir them in. Let me know if you try it and how it turns out! The whole family enjoyed this (including 1 and 3 year olds). This is a great soup – fast and with interesting flavors. 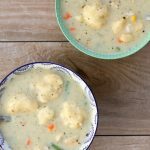 We make tons of instant pot soups which can begin to all taste similar, but this is a little different and fun! Thank you! Thanks Linda! I will tell you! Amazing and easy!!! Used what I had in the pantry + frozen chopped chicken leftovers in freezer. Used white rice, no corn. Truly a deep, flavorful, rich and satisfying soup. 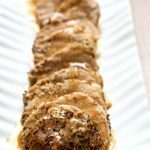 So easy in instant pot, too! Well done, Karen! So glad you liked it Marcy! Made this recipe for the first time tonight and it was AMAZING! Definitely will make again. Can you make this with precooked chicken breast or rotisserie chicken? Yes you could. I would probably add it in after it has cooked so it doesn’t get overdone. How would I use chicken broth instead of bouillon? Do I need to reduce the water? I don’t want to make it too soupy. I’m also using white rice instead of brown. I would do 3 cups of broth and 1 cup of water. You’ll need to adjust the time for the white rice as well. I’d cut the time down to 10 minutes. Hi Cheryl, I don’t think it will fit. You may need to halve the recipe. I just came across this recipe, sounds good. Do you think I can substitute the cream cheese and use sour cream instead? And I have canned yellow corn can I use that instead of frozen? Yes I think both of those changes will work well! Fabulous! I don’t have a very high spice tolerance and this was perfect for me, even with medium salsa. Definitely will make this often. Thanks! This is a great base recipe. 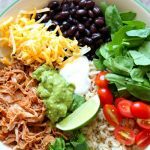 I have tried it 6 different ways and my favorite is doubling the black beans (no white beans), using a full cup of brown rice and using red enchilada sauces vs green. Doesn’t matter how I’ve modified the base it’s great!! I never use the dairy however. You can cut down on the water by a cup. I’d only cook for 10 minutes and then natural pressure release. I want to make this Sunday night. Can I leave out the rice alll together? If so what adjustments do I need to make? Liquids? Cooking time? Thank you! Could I use instant brown rice?? you *could* but I believe the cooking time would be way to long and the rice would be mushy and possibly disintegrated. You could stir the minute rice into the soup after it is cook and let it cook on the saute setting. That would be a better bet. 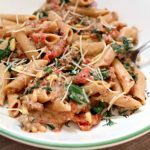 I made this last night with Whole Grain Brown Rice and it was absolutely fabulous, i didn’t make any changes to account for the whole grain. Best thing I made in my new Instant Pot so far! That sounds fabulous! I’m so glad you liked it and it worked out for you. If I double this, how much would I need to adjust the cook time for more rice? (Or would I need to at all?) THANKS! no need to adjust the cooking time! Just made this! So delicious! I did not have the enchilada sauce, subbed 8 oz. tomato sauce. Left out the beans, and used white rice. Glad you liked it Vicki! Oh my goodness! Delicious! Thanks so much for the IP recipe; I am a new user and I have been looking all over for easy recipes. This one is a keeper. I had to make just a few changes, because it’s what I hand on hand: I used chicken broth instead of the water and bouillon, only had black beans (and I was worried that this would ruin it! ), and the last was that I used quinoa instead of rice – but again, I don’t know that I would even use that again, because I didn’t really think it added to the flavors or consistency. It was so yummy! Thank you again! I don’t like spicy foods – is this spicy? It sounds amazing, and I really want to try it, but not if it’s got a lot of heat! Just made this yesterday. Huge hit! Definitely will make this again. When you say “white beans”… do you mean cannellini beans or Great Northern beans or something else entirely? I’m just getting into IP cooking … and well, cooking in general … so I’m learning about all the various beans I could potentially buy. Please don’t judge me! Hi Jenn, I think you could totally do either! I used a can of S&W lightly seasoned white beans…I’m actually not sure what kind of beans they were. My grocery store didn’t have a seasoned white bean, so they suggested white chili beans. Do you think they will work? I’m sure that would be great! Looks great, and will hopefully make it soon. If I wanted to leave out the beans, would I need to adjust the cooking time? nope, keep it the same! what modifications would be needed to make in crockpot? Cover and cook on low for about 6-8 hours or until rice is tender. Shred the chicken. When cream cheese is melted you can ladle it into bowls and serve with desired toppings. The only problem I foresee if the rice. I’m not exactly sure how long it is going to take to cook. Will you let me know how it turns out? I’m trying this out in the slow cooker tonight! The only ingredient I do not have and consistently forgot to get at the store was the chicken base 🙁 hopefully if I get to the store before it’s done I can mix it. I will comment back on results! do you have any chicken bouillon? you can use that too! 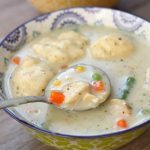 I went out that night to pick up the chicken base you recommended to use for this recipe and the result on this soup using my crockpot and your instructions came out utterly fanstastic, I’ve had the left overs repeatedly and I’m pleased. EVERY. TIME. Oh, I’m so happy to hear this!!! This looks really good! Can I use yellow corn instead of white? I’ve never heard of white corn. Also, can I skip the rice altogether for a lower carb meal? Will that affect cook time, liquids added, or thickness of the soup? Hi Michele, yes you can use yellow corn. You can skip the rice however it won’t be as thick and creamy. You can add in less water if you want or just have the soup be more brothy. You will not have to cook it as long without the rice. You’ll only need to pressure cook for 10 minutes.